Having an effective way to report defects should be a key part of your vehicle maintenance regime. It’s also a good way to make sure your drivers know which defects to look for. This could include locked emergency exits or missing break-glass hammers on buses and coaches. It’s estimated that 85% of roadworthiness infringements could be avoided if the driver does a walkaround check before starting the journey. Operators are often called to public inquiries because drivers have missed defects during their walkaround checks, or in some cases haven’t done checks at all. If you audit your drivers regularly, you’ll know how well they’re keeping on top of this vital work. Your drivers aren’t expected to be mechanics but their vehicles should be in a good roadworthy condition before they go out on the road. A reminder or re-education at toolbox talks, or on a one to one basis about the importance of walkaround checks could prevent a prohibition or further investigation. 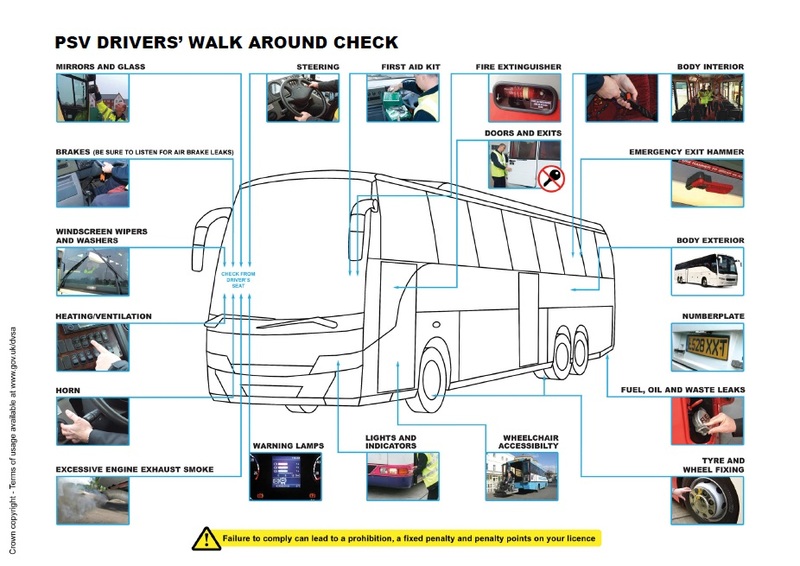 You can share these walkaround checklists with your drivers, explaining what checks are required for trucks and buses. 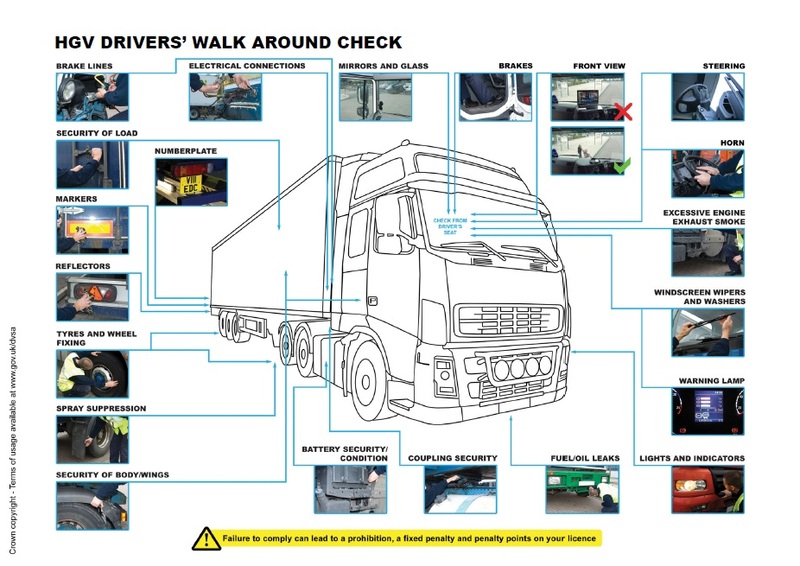 There appears to be a large gap between the competency of many drivers carrying out walkround checks and that of the DVSA examiners (probably skilled or semi skilled mechanics specificallly trained by the DVSA) engaged on roadside checks. The DVSA may say that they don't expect drivers to be mechanics but the fact is that drivers need to check to the same standard or be liable to prosecution. More detailed and relevant information is required. The driver CPC does not seem to have the necessary rigor. Surely educating drivers and eliminating defects is a better option than prosecuting drivers for defects found present when the vehicle is in service? Safety is the issue, I hope. I am very concerned about vehicle safety and seemingly driver work and tacho hours.no maintaince staff on duty for large parts of the working week.vehicles being sent out with known defects. The importance of Transport Compliance Audits should never be overlooked. Along with regular driver engagement and spot checks there is no excuse for allowing a defective vehicle on the road. Drivers and Operators all have their part to play. I agree with some of the other comment's that it should not become a tick box exercise, and operators should provide speedy resolution to all defects to promote good reporting from the driver workforce. Unfortuately the same goes for some drivers who believe it is just a paperwork excercise. Ive known drivers complete a daily walkaround sheet whilst sat in the cab. I think the most important thing as an employer is to show that reported defects are dealt with promptly or you do run the risk of drivers believing that it is just a box ticking excercise. What can be done if you are working for a bus company and most of the fleet of buses have defect and should not be on the road much less being in service carrying passengers! Who and how can a driver report it without being name or loosing his/her job? System works well,only if your company take note of your defect reports.with some large transport company's it appears to be a paper work exercise.